You are here: Home / Giveaways / Mobile Bonuses / Parlay Bonuses / Soccer Betting Promotions / Sportsbook Bonuses / Sportsbook Promotions / NordicBet’s Champions League Final Predictor Can See You Win €2,000! If you’ve got a lucky hunch about the winner on Saturday, then join NordicBet’s Champions League Final Predictor to win a cool €2,000! The top 10 players that make accurate predictions with NordicBet’s Champions League Final Predictor will qualify for various cash prizes, with the winner getting the biggest reward – €2,000! 2nd and 3rd places will see players win €500 and €300 respectively with the online sportsbook, while 4-5th sports will earn them €100. And finally, 6-10th place with the Champions League Final Predictor will reward players with €20 Bonus Money. All you have to do is place a wager of €10 (or more) on a Champions League final market with minimum odds 1.50 (1/2) for a chance to win €2,000! The Real Madrid vs Atletico Madrid match will be played this Saturday (May 28), so use this time wisely to make your Champions League Final Predictor count. There are a set of 8 questions that you have to answer with the Champions League Final Predictor to qualify for the top prizes: Result and Total Goals, Number of Corners, Total Yellow Cards, Total Substitutions and other fun questions. The promo is only valid for players coming from the following countries: Norway, Sweden, Finland, Denmark, Czech Republic, Switzerland, Germany and Austria. NordicBet online sportsbook has given Zidane’s men favourite odds 2.45 (29/20), while their cross-town rivals Atletico Madrid are underdogs for the match 3.10 (21/10). But considering the strength of both sides, we believe it would be wise to place a wager on a draw 3.20 (11/5) between the two Madrid clubs. Diego Simeone will have a chance to exact revenge on their main rivals, as they lost the final to Real Madrid two years ago, which saw former miss out on lifting their first-ever European title. But let’s keep our fingers crossed that the underdogs can win this time around and by doing so deny Real Madrid their 11th Champions League title. 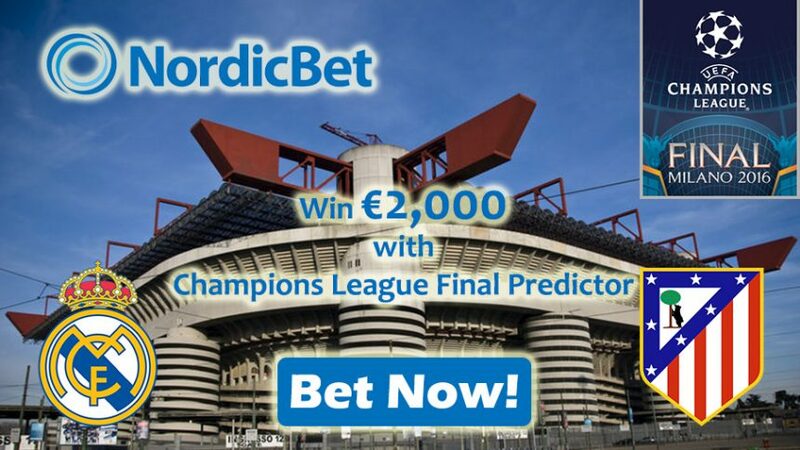 Join NordicBet Sports to win the 1st prize of €2,000 with the Champions League Final Predictor! Make your predictions with the Champions League Final Predictor now!